In a country with deep roots in metal but where such music is still much frowned at, having the City Hall backing up a metal event is a big thing. Even if we had to watch the concerts sitting down… I confess I was expecting the audience would eventually stand up, but that didn’t happen. Guess we wanted to prove the City Hall and the classy Rivoli theatre staff that we were all civilized, law-abiding citizens. Calling it “Porto Best Of” is probably a tad pretentious, especially when there was only three bands on the bill, but then again, it showed respect for who was performing. 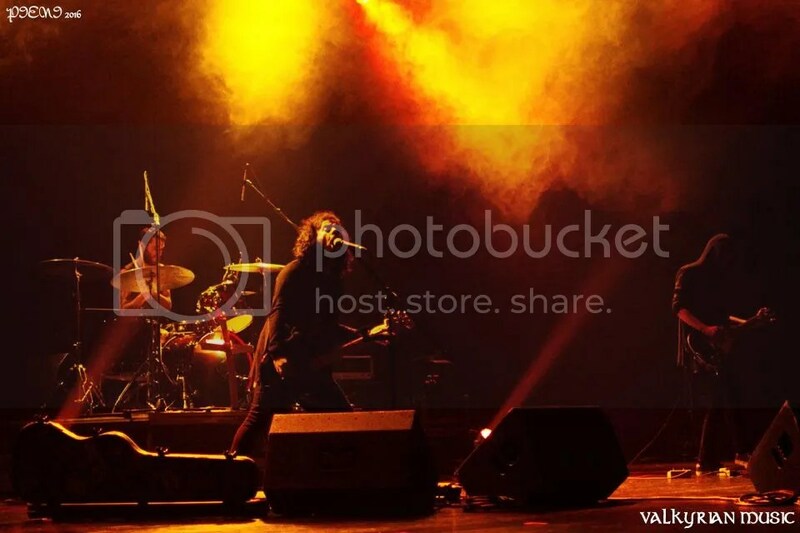 The first of those bands was Redemptus, a sludge/post-metal act that was formed two years ago in S. João da Madeira (yeah, the “Porto” part is also misleading). Why them and not some other with a longer career? Well, first, they’re good, and that’s reason enough; but there’s a second, which lies in their members having been around way longer and built quite a career in several different projects. Surrounded by smoke and dim-lit by red lights, the trio performed pieces featured in their debut “We All Die The Same”, released by Raging Planet Records early last year. It was really weird watching Equaleft sitting down. While it’s easily manageable to headbang in that position to Redemptus’ sound, Equaleft’s groove makes your whole body pulse and the urge for movement is harder to control. But we did it, somehow. As for the band themselves, they didn’t stop and the floor literally throbbed to songs like “New False Horizons”, “Invigorate” (the light-saber song) or “When Ruin Becomes A Bliss”. Tarantula is one of the biggest names in our heavy metal history so even though they haven’t been playing much and their latest record dates from 2010, it made sense to have them headlining this event. Their career hits the 35-year mark, if we count the four years going by Mac Zac. In 1990 they would release what’s considered their most significant album, “Kingdom Of Lusitania”, and that’s the album they celebrated that night. Among the big hits of the rest of their discography, that is, such as “You Can Always Touch The Sky”, “Freedom’s Call” or “Face The Mirror”. No “Power Tower”, though a few fans asked for it… Still, in the end, I didn’t see any disappointment in the almost sold out theatre except for that – that it had ended. After more than three decades, Tarantula still know how to pull a great heavy metal show and make you sing along and raise your fists like there’s no tomorrow. 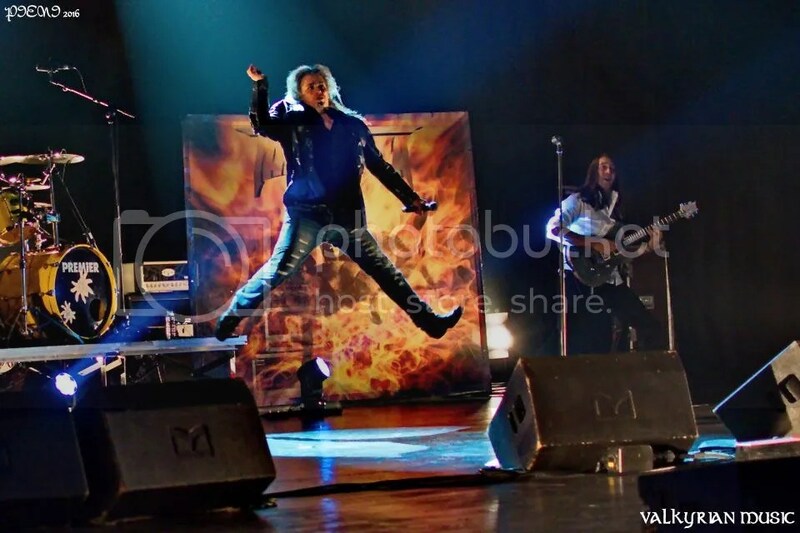 Formed in 1983 as Legacy, Testament were forced to change their name – the usual there’s-already-a-band-with-that-name thing – and that change happened three years later. So even if their whole history is a bit older, Testament turn 30 this year. What better way to celebrate than releasing a pure thrash metal record, probably the best they’ve done in years? ‘Cause that’s what “Brotherhood Of The Snake” is – a thrash metal bliss. We use the expression “breath of fresh air” whenever a band adds something new to the genre, but it’s just as refreshing when a band manages to stay in character and makes it sound like a novelty. The fierceness and excellence of their songwriting is surely well known, but you still won’t be expecting the blow that your ears will take with the title-track or “The Number Game”. The machine-gun speed with which Chuck Billy sings “Stronghold” will remind you of songs such as “Over The Wall” and the gang chorus has the same power as the one in “Into The Pit”; similar formula, including the hit-potential, but you won’t feel like you’ve heard it all before. “Refreshing”, remember? Same with “Seven Seals”, where they go for something less aggressive but still heavy, like they did with “Souls Of Black”, or the headbang-friendly “Neptune’s Spear” that’s as catchy as “Electric Crown”, but it’s just the nature that’s comparable – “The Brotherhood Of The Snake” offers ten distinctive, killer songs which will renew your faith in thrash metal. Iron Maiden will be continuing the European leg of The Book of Souls World Tour in the spring of next year. The support for all the dates will be the American hard rock band Shinedown. The first show will be in Antwerp, Belgium on 22nd April 2017 followed by a few shows in Germany before moving on to The UK and Ireland. ‘Breaking the Rock’ is the second album from the French heavy metal band Existance. 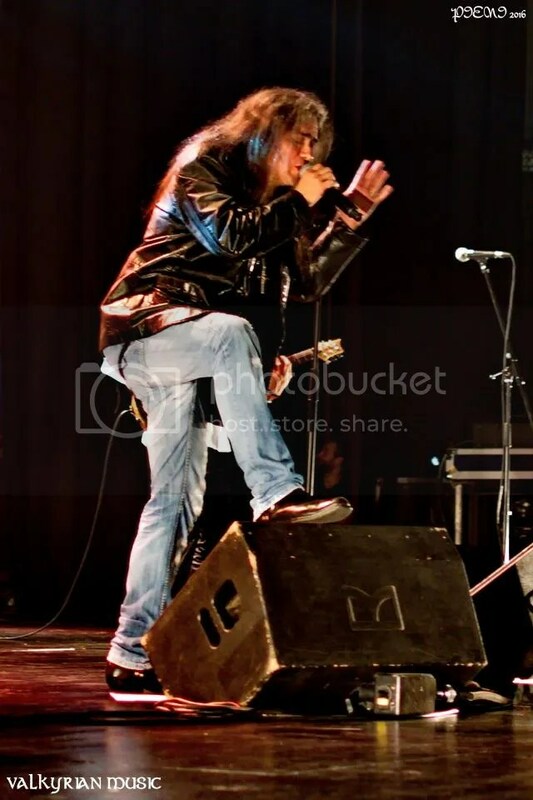 The band was formed back in 2008 by Julian Izard (son of Didier Izard from the speed metal band H-Bomb). 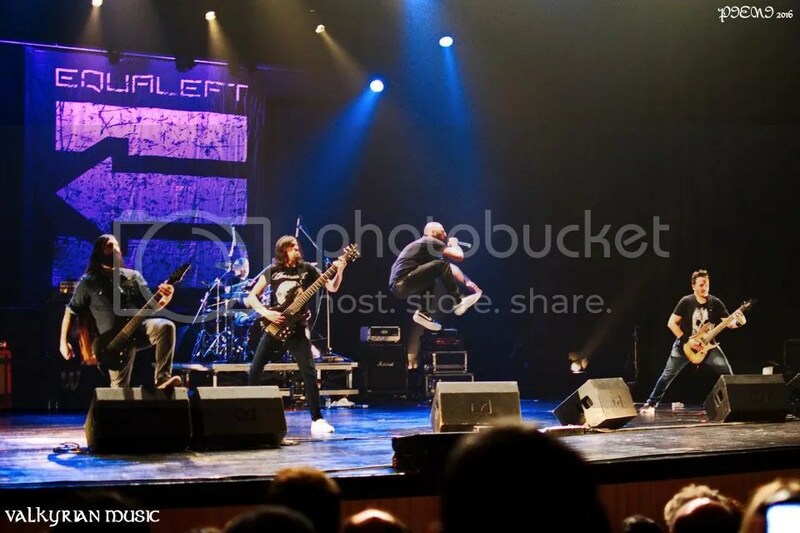 Existance expressed their aim to “keep the spirit of the 1980s heavy metal alive”. Their music has been compared to the likes of Iron Maiden, Judas Priest and Saxon. 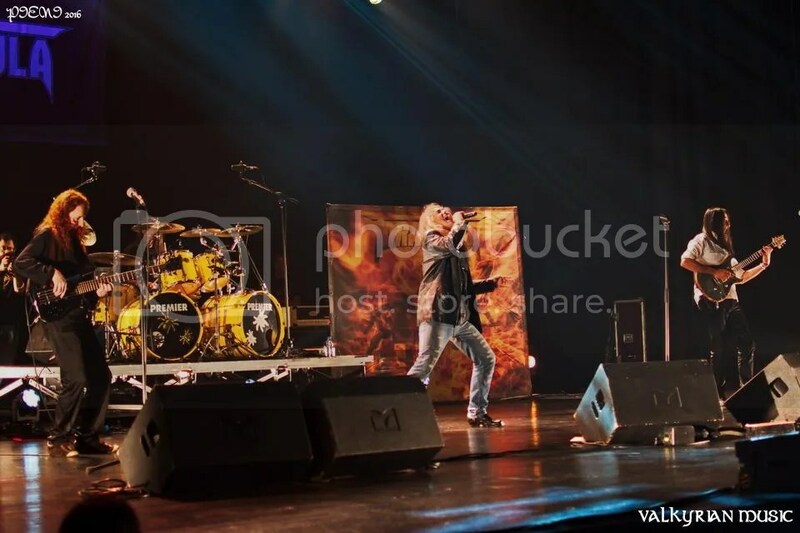 First off is Heavy Metal Fury with a deceptively slow and melodic guitar intro paving the way to some classic heavy metal in which most of the emphasis is on the guitar riffs and Izard’s melodic vocals. The 80s heavy metal influences are fairly easy to detect; the guitar patterns, riffs and vocal style reminds me of the more prominent bands from the NWOBHM movement such as Judas Priest and Iron Maiden. If it’s retro-style, heavy metal guitar riffs you’re after, you will find them in abundance on tracks such as All Is On Fire, Pain In Paradise. As with most classic heavy metal albums, there’s usually at least one slow ballad to show the band’s ‘softer’, more melodic side and (hopefully) underline the skills and vocal range of their singer. On here we get Sinner of Love in which it’s definitely the vocals that enter the spotlight. Izard’s vocals are a good match to the guitar melodies giving the song a pleasant vibe. By contrast there’s the adrenaline-packed title track which really speeds things up in the riff department. Overall, ‘Breaking the Rock’ is more than just a homage to 80s heavy metal. Existance did a great job of replicating the sounds of that era in metal music and their influences are fairly evident. It’s practically a genre-defining album. This is classic heavy metal in its purest form. The Norwegian metal duo Darkthrone doesn’t need much of an introduction. Their early albums such as ‘A Blaze in the Northern Sky’ are regarded as classics of the black metal genre. Also, let’s not forget their drummer Fenriz’s witty comments and his passion of underground music. They’re one of those bands who isn’t afraid to alter their style and experiment with something new. Since the start of their career they have gone through various transformations ranging from death metal to black metal followed by experimentation with punk and heavy metal music. Personally I lost track of them after ‘The Cult is Alive’ album back in 2006. Then recently I heard their new song ‘Tundra Leech’ on Youtube and I decided to give them another go. First up is the familiar, eerie sounding Tundra Leech – the track which convinced me to obtain a copy of this album. It’s great to hear Nocturno Culto’s haunting voice again, sounding just as grim as he did in the band’s early days of black metal. Nocturno Culto is singing on all the tracks on here which is really good in my opinion. I’ve always preferred his harsh and creepy vocal style to Fenriz’s hooting clear vocals. As for the music, the guitars have this old school feel to them as if they were trying to replicate similar riff patterns as they used in the 90s. By ‘old school’ I mean a mixture of old school black metal with a slight thrash metal tinge audible in the guitars. In other words it’s still very grim-sounding but it’s way too fast and too catchy to be considered “true” and “kvlt” black metal any more. Boreal Fiends stands out due the melodic instrumental intro at the start; slowly drawing you closer into the deep dark forest with the grim guitars, drums and Nocturno Culto’s haunting howls as your only guides. Then there’s Inbred Vermin, a bit of an oddity, which sees the band play around with some heavy metal and (dare-I-say-it? )…Motörhead-esque guitar patterns mid-track, neatly sandwiched between frostbitten, ultra-haunting howls and black metal guitar riffs. These guys clearly enjoy both these styles, so why not combine those two? And why not? Who says that Motörhead doesn’t go well with Hellhammer or Celtic Frost? Also why stop there when you can also add some thrash metal into the mix? That pretty much sums up what the managed to achieve rather successfully with the title track. Overall this ‘Arctic Thunder’ sees Darkthrone revisiting their roots – the sounds that have influenced them in the early days and putting a new spin on it. It’s got the same eerie and cold atmosphere as their highly regarded black metal albums, but it’s not restricted to one specific metal genre. The closest thing I can think of to describe their current sound would be something like ‘blackened heavy metal’. Luckily I’m not any kind black metal purist, so grim and frostbitten ‘blackened heavy metal’ sounds just as good to me. 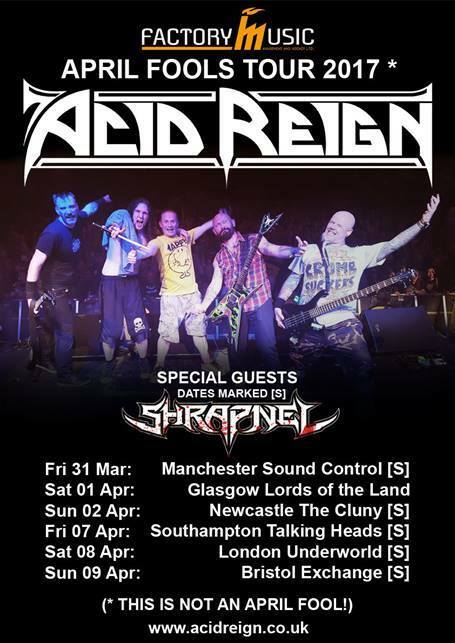 Acid Reign announce UK tour! Coming off the back of their now already legendary headlining set on the Sophie Lancaster Stage at this year’s Bloodstock festival, it is with great pleasure that rebooted UK thrash legends Acid Reign announce their first headline UK tour for 26 years! Dubbed the “April Fools Tour”, Acid Reign, led by enigmatic frontman Howard ‘H’ Smith, will be playing six dates across the UK in March/April 2017 bringing old/young friends Shrapnel with them as special guests. Tickets on sale Friday October 14th @ 11am!